Months ago, I bought myself a beginner’s embroidery kit, thinking it would be fun to learn how to make pretty things. Of course, it just sat there in its little box all this time, because I never got around to it. So, thank you, Thing-a-Day, for forcing me to open it up and give it a try. The kit comes with a hoop, two squares of fabric, some embroidery floss, and a needle. 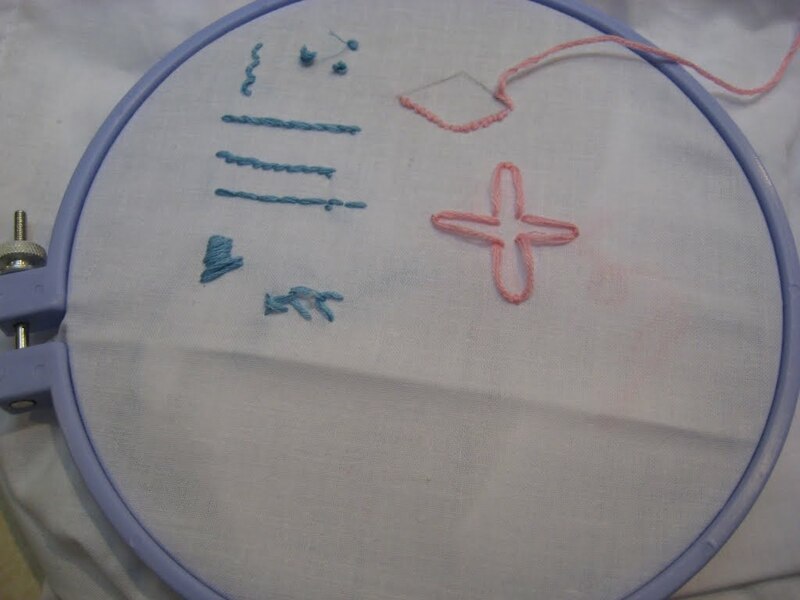 All I did today was practice stitches from the how-to book, because I am the beginniest of beginners. The book is cute and funny and aimed at maybe a teenage crowd, and it has illustrations of some of the basic stitches, which I tried to follow, with mixed success. Those dots on top are “french knots”, and to their left is a “scalloped stitch”. I also tried a split stitch, a stem stitch, and a back stitch. My sad chain stitch attempt is the thing that looks like a murdered stickman on the bottom. I also tried a flower and a shape before I got tired of undoing all the knots I was creating. I’ll be looking for some instructional videos online, because I think seeing the stitch will be better than reading instructions and trying to follow a diagram. This has potential, though, so I’ll continue trying until I get it. This entry was posted in Uncategorized on February 8, 2011 by antijen.